During our journeys across the world, we sometimes happen upon strikingly beautiful edifices carved out of pitch black granite, sandstone and other basaltic rock formations. The UNESCO World Heritage site of Ellora can be considered a visual epic narrated in black stone. Not too far away from Ellora, another ancient monument, namely Chennakesava Temple, has managed to sculpt a charming visual poetry out of black soapstone. China has a long and illustrious tradition of sculpting highly ornate furniture out of ebony or ebonised wood. They are inlayed with pearl, marble, turquoise and jade to give a striking look. Stepping into the modern era, we see only a restricted use of black in the interior or exterior of a building. Extreme space crunch in modern buildings does not help in the matter either. 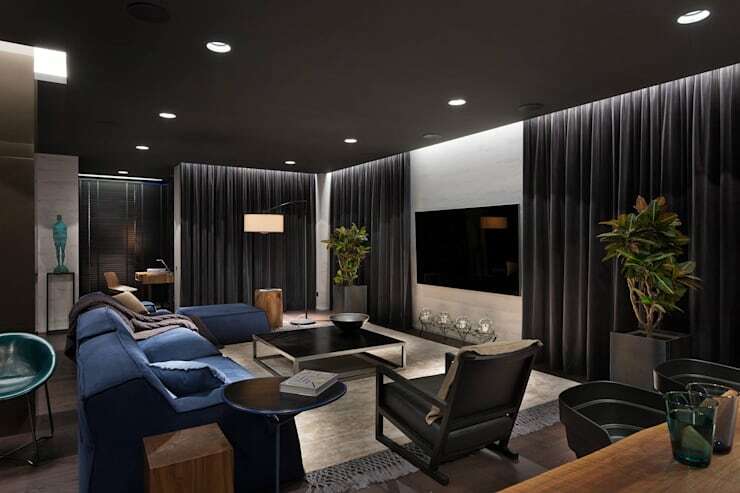 There is a prevailing notion that black in interior can create a gloomy and overly dark ambience. In some traditions black is considered a colour of sorrow. This too prevents people from extensively using this tone in the interior. However, contemporary designers are once again bringing black back in fashion. So today we will learn how to skilfully integrate the shade of kohl in your rooms! 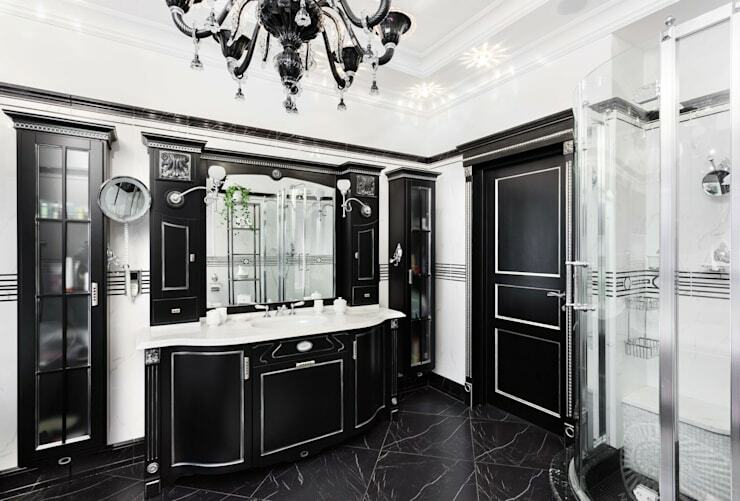 Shiny black tones can create a highly classy ambience. Use wall panels or wallpaper to deck up your walls in black. Otherwise, coat your walls in black tone. Create a contrast by using a matte shade for the walls and shiny one for the doors and windows. Like white, black paints are available in a variety of shades. You can choose between raisin black, ebony, charcoal which is actually a very dark shade of grey, black olive and onyx black shades. Like shades of grey, black is a neutral tone and creates a nice backdrop for your furniture and accessories. Painting your ceiling in black, using ebonised wood panels for the ceilings or black MDF panels is another way of introducing this colour in your home. A pitch dark ceiling may look ominous and lower than it actually is. So light up your room properly. Use ceiling mounted task lighting to remove any trace of gloom. Install wood flooring to balance this ultra dark shade. Wood exudes natural warmth enough to offset any grave feeling that may result in painting a vast area in dark tone. 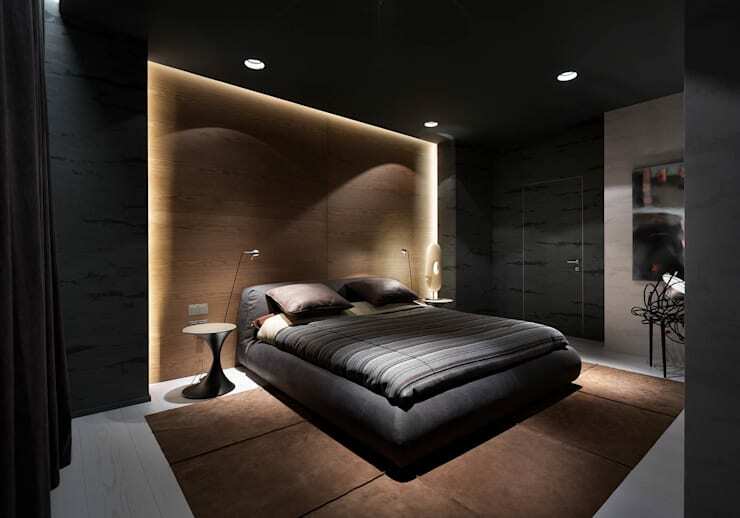 You can easily create a dramatic atmosphere by using black granite, mosaic, ceramic or porcelain tiles. Linoleum flooring with black accents are gaining in popularity once again. From hallways to living room, the unusual texture of natural stone is enough to stylise any part of your building. It is also a “cool” option homes belonging to warm to temperate zones. Black porcelain, a durable and a stylish alternative, can be used to decorate high moisture areas like kitchen and bathroom. Like polished natural stone, they are easy to clean and require minimal to zero maintenance. Furniture made of ebonised wood or upholstered in fabric is another way of having a stylish interior steeped in kohl black tone. While ebony wood or other types of natural wood having a similar patina looks elegant for the interior, they are pricey and difficult to obtain. Only experienced craftsmen can give an authentically ebonised finish to any furniture. You can source them from local shops specialising in handcrafted furniture. Fabric and leather upholstered furniture is slightly less expensive and easier to obtain. From velvet to satin, silk to cotton the choices are many. Faux leather or pleather stained in black can be chosen for this purpose as well. Alexei Shcherbakova from Incube Design used upholstered bed for this chic bedroom. Try to match upholstered furniture with curtains in same or complementary tones. 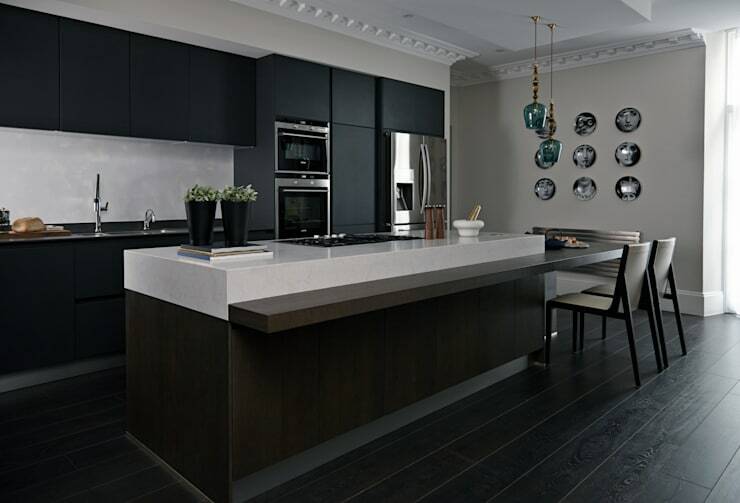 How about giving your kitchen a stylish black finish? Use cabinets and storage units with black doors. Install kitchen countertops made of black terrazzo, polished or honed granite, tiles or soapstone. Countertops laminated in black can be another affordable yet trendy solution for a fashionable kitchen. You can also choose flooring material in black, but it will be better not to overuse this tone. For example when using black flooring material, tone down the features of your kitchen or when black cabinets are supposed to be the focal point keep flooring and wall paints neutral. This will accentuate the contrast to create a strikingly beautiful and dramatic interior. To deck up your stairs in black you can use stone or laminated wood. Wood can be painted or patinated in black too. This very important architectural feature can act as a floating sculpture too. You can even use a cosy black rug on your staircases. But be careful! Have sufficient lighting to brighten up the area and prevent any accidental fall. 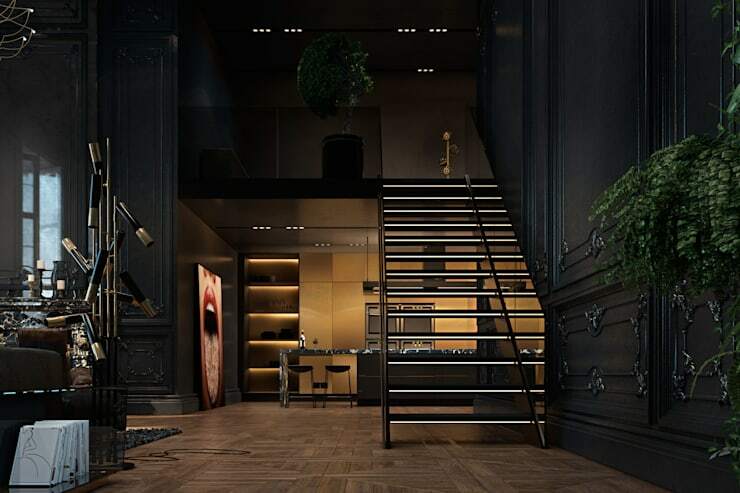 Otherwise, your black staircases could turn out to be a notorious feature of your home. 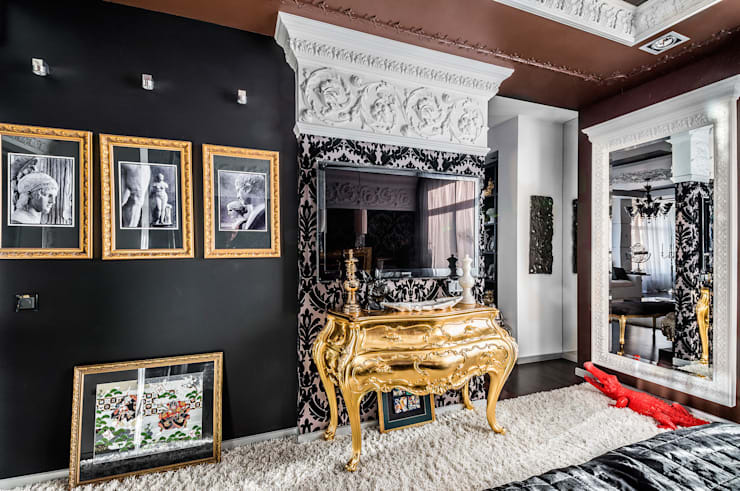 Use gold accents to glamorise your black rooms. Add decorative accessories, nightstands, lampshades, pendant lighting or simple door knobs steeped in gold tone. Any one of these or a tactful assortment of many items can easily introduce an element of surprise that you are searching for. The presence of black too will not look so overwhelming. In creating an elegant space, your bold choice will pay large dividends in months and years to come. Expect to be congratulated by friends and strangers alike for your ingenuous decorating choices! 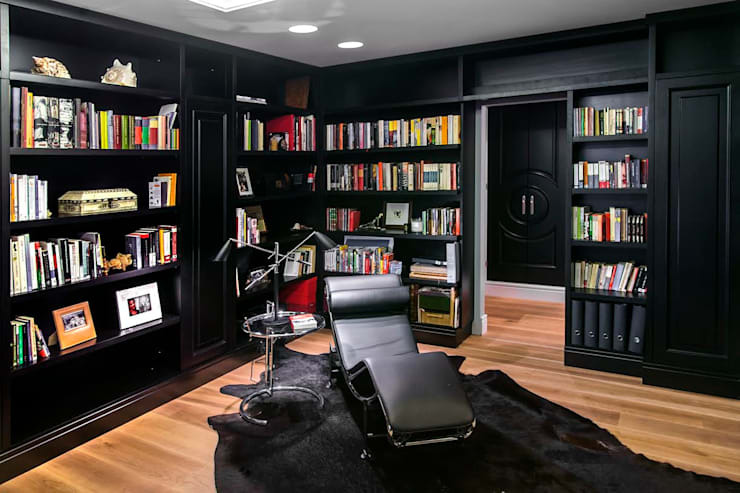 Inspired to incorporate black in your rooms? Already a dark decor fan? Let us know in the comments!